SCVHistory.com | Placerita Canyon | Lloyd Earl's Golden Oak Ranch, Pre-Disney Purchase, News Reports 1940s-1950s. 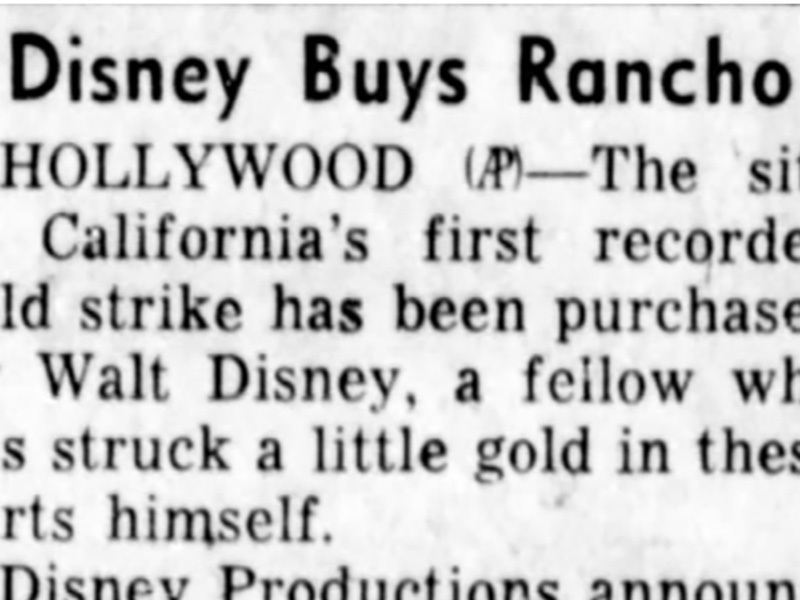 Lloyd Earl's Golden Oak Ranch, Pre-Disney Purchase. Mentions Disney use, establishment of state park. Thar Was Gold in Them Onions. By Annie Lee, Los Angeles Times | December 6, 1956. Our story today begins more than 100 years ago, long before you or I were born. It is a story about an oak tree 50 miles [sic: 35] north of Los Angeles and a sheepherder [sic: cattle] who discovered gold six years before James Marshall found the precious ore on John Sutter's Ranch. Our sheepherder, Francisco Lopez, wandered into a lonely canyon one day in 1842 with his sheep [sic: cattle]. It was a very hot day so he lay down under a beautiful spreading oak tree to take a short nap. When he awoke he found he was clutching a bunch of wild onions but before he threw them down he looked at the roots and lo and behold, gold was clinging to the roots. Francisco could hardly believe his eyes, he must have thought he was dreaming the same dreams Coronado had dreamed when he called for the Seven Cities of Cibola. He jumped up and ran to the San Fernando Mission. Excitedly he told the padres there of his “dream” and produced the gold-encrusted wild onions to prove that his dream was not only a dream [sic; no evidence he shared the information with the clergy]. The priests looked very carefully and told Francisco the yellow dust was really gold. Hurriedly Francisco went back to the big oak tree to search for more of the yellow flakes. Meanwhile, his sheep had wandered away and no one knows what happened to them [sic]. We do know that thousands of men seeking riches poured into the canyon. Men herded other men in their lust for wealth. The canyon with the tree where Francisco took that memorable nap soon came to be called Placerita which means little placer after the most commonly used method of gold mining. The big oak came to be known as the Oak of the Golden Dream [note: the tree-and-dream story first appears in 1930]. Soon the gold was gone, $80,000 worth, and the site was once again quiet and peaceful. Soon the Republic of Mexico no longer ruled and California became a State. Placerita Canyon then came to be known as a landmark and then people just forgot about it. Except a man named Lloyd Earl who bought the land nearest the head of the canyon and developed it. Hereford cattle were put out to graze and Placerita Creek was channeled. He called it Golden Oak Ranch. Then in 1949, 50 acres were put aside and proclaimed a State park which is enjoyed by California citizens. You may be enjoying it too, although you don't know it, for this famous country may be coming into your home by way of your television set. You may not recognize the Golden Oak but you probably recognize the Triple R emblem over the door of the barn in the Spin and Marty series now being run on the Mickey Mouse Club. Here on the Golden Oak Ranch and the Placerita Canyon State Park Spin and Marty and Joe, Speckle, Freddy, bill, Mr. Logan and the beautiful horse Skyrocket perform adventures before cameras so you may be entertained at home. So now you know, on television the Golden Oak Ranch is known as the Triple R Ranch in the Further Adventures of Spin and Marty starring Tom Considine as Spin and David Stollery as Marty. I wonder what the ghost of Francisco Lopez would think of the electronic miracle that brings the site of his famous discovery into American homes daily, don't you? News story courtesy of Tricia Lemon Putnam, 2017.